Lalbaug, the prominent destination of Mumbai, is famous in Mumbai. The place is special for its divinity. 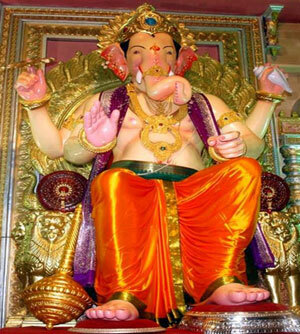 The Hindu deity, Ganesha, is popularly known as "Lalbaug Cha Ganesh" in Lalbaug of Mumbai. Few millions devotees assemble on this holy spot during the great carnival of Ganesh Chaturthi every year. Be prepared to wait for few hours in the queue to take a glimpse of some of the spiritual Ganesh idols. Lalbaug Cha Ganeshutsav mandal, formerly known as "Sarvajanin Ganeshatsav Mandal", was formed in the year 1934 at the existing place. The mandal was formed when the freedom fight was at its peak. The great freedom fighter Sri Lokmanya Tilak was first introduced the idea of forming the Mandal to worship the deity to let people know about the ongoing freedom fight. The motive behind encouraging the crowd to worship the deity was to build and unite the large mass of Mumbai. Some new but innovative programs were started during 1948 to 1968. "Shri Satyanarayan Mahapooja" and "Pan-supari Samarambha (Get Together Function)" were organized where eminent personalities from various artistic fields and devotees assembled to enrich themselves. This has helped to increase the harmonization and more importantly the views of various scholars were exchanged. At the same time it improves the synchronization and relations of numerous mandals. Different mandal authorities of Lalbaug were helping the nation financially. The tradition still continues. Lalbaug is continuing its earnest efforts for the mass and society. The website www.lalbaugcharaja.com was launched in the year 2000. The website is really very helpful for the devotees who want to come for the occasion. The website portrays colorful picture galleries, provides information related to the festival and lets people know about various social activities. The immersion of the Lalbaugcha Ganesh is another attractive process. The authority takes proper and apt initiatives with the help of experts during the time of "Visarjan" (Immersion). A "Tarafa" (iron Raft) was built to dissolve the idol deep into the ocean during immersion.